SAN FRANCISCO — Several thousand educators from nearly 265 community colleges throughout the nation are meeting this week to strategize over how best to support and enhance student success work at their respective institutions. 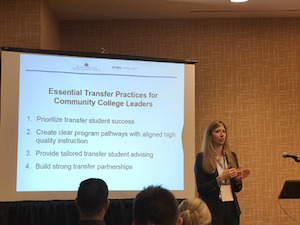 Over the past several days, policymakers, thought leaders and practitioners have gathered to share best practices on how to help community college students complete college. At a time when nearly one-half of all students in the United States are enrolled in a community college, advocates say that college completion is more important now than ever before. Sarah Zauner of the Aspen Institute speaks at the Achieving the Dream annual conference in San Francisco. In California, for example, there are 2.1 million students enrolled in the state’s 113 community colleges. The drive to improve student success rates has been encouraged by several philanthropic entities like the Kresge and the Lumina Foundation. In 2004, Lumina, along with the support from others, established Achieving the Dream, which is now operational in more than 35 states and the District of Columbia. “We are helping more than 4 million community college students have a better chance of realizing greater economic opportunity and achieving their dreams,” said Dr. Karen Stout, president and CEO of the organization headquartered in Silver Spring, Maryland. At the opening ceremony of the conference, two community colleges — Miami Dade College and Pierce College — were presented with the Leah Meyer Austin Award for their work in improving student outcomes and reducing the achievement gap among its students. During a plenary session, Dr. Christine McPhail, Emerita Professor of Higher Education and founder of the Community College Leadership Doctoral Program at Morgan State University, said that community colleges must embrace a pedagogical framework for cultural competence. For Nhan Ta, 18, an international student from Vietnam who attends Pierce College, it was gratifying for him to see academicians fully invested in his future.